Pentair's ULTIDRI® Oil Conditioning System keeps lubrication and hydraulic oil in optimum condition. Over 70% of equipment failures can be attributed to oil contamination, clean oil is fundamental to operational reliability and cost control. 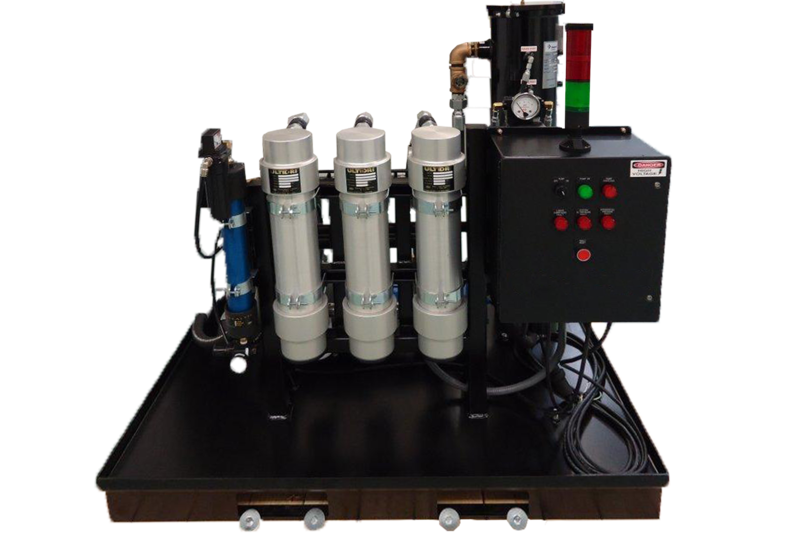 The technology was developed as an easily scalable oil conditioning system to remove solid contaminants and free, emulsified, and dissolved water from lubrication and hydraulic systems. The membrane fiber is bundled into dehydration contactors where the oil to be treated flows through the inside (or Lumen) of the fiber and dry air “sweeps” the outside of the fiber to capture and remove the moisture. 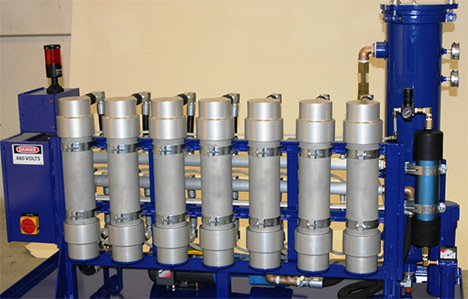 Example of a seven contactor Ultidri system. The ULTIDRI system provides reliable oil conditioning in order to minimize equipment wear and downtime, and to reduce replacement and maintenance costs. All lubrication systems aim to continuously provide a layer of oil to reduce friction between moving parts. Water contamination is a common problem in lubrication and hydraulic systems, resulting in degradation of equipment components and the lubricant itself. 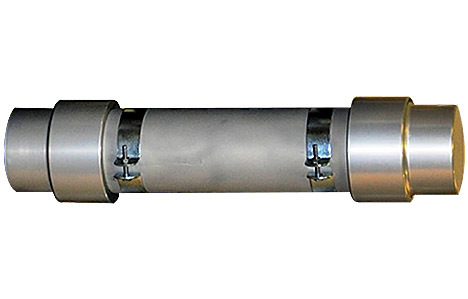 Once the oil is affected by oxidation, additive depletion, and viscosity changes, then sludge deposits, corrosion, and abrasive rust particles are not far away. 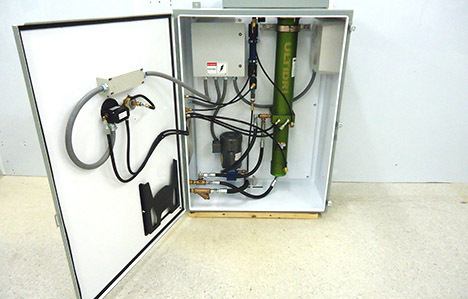 The ULTIDRI system delivers the means to operate with clean and ‘dry’ fluids at all times. The technology brings extremely low moisture levels, often well below the saturation limit, within easy reach. As the system runs continuously, these low moisture levels are sustained for maximum protection at all times. The ULTIDRI Oil Conditioning System combines filtration and membrane technologies to thoroughly remove all contaminants and water from lubrication and hydraulic systems. Pentair’s DURION® membrane technology is the future of moisture transfer, and the answer to the complexities and costs of traditional oil conditioning methods. Due to its chemical resistance and mechanical strength, this advanced and highly durable material is ideal for the job. Pentair's oil conditioning technology utilizes the mass transfer capacity of completely dry air (<1% humidity) to effectively remove free, emulsified, and dissolved water – in most cases below the moisture saturation limit. Hollow-fiber membranes distribute the oil into thin films to encourage dehydration. 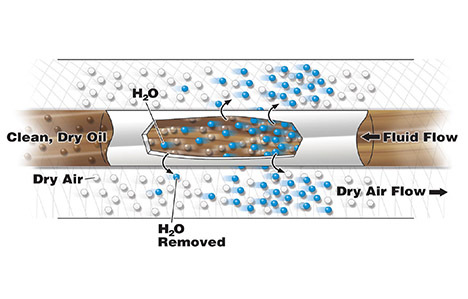 Water diffuses from the oil through the membrane into the dry air and is exhausted into the atmosphere as vapor. Clean dry oil remains in the system. ULTIDRI was developed as the ideal alternative to conventional vacuum purifiers, which need highly skilled operators and are generally considered too labor-intensive. Conveniently sized and easy to maintain, the ULTIDRI system is well suited for a range of industrial and portable applications. The self-contained units are easy to install, simple to operate, and require only minimal operator intervention. Providing robust protection in a compact, self-contained package, the portable ULTIDRI models are popular because of their versatility and small footprint. A unit may be dedicated to a single reservoir for continuous oil conditioning, or used across multiple reservoirs. With its scalable modularity, allowing for cost-effective application at virtually any flow rate, the ULTIDRI system offers the ultimate in usage flexibility. Click here to download the product brochure UltiDri.